Iran has hailed the “liberation” of Syria’s largest city Aleppo by foreign forces — including Iranian troops and Iranian-led Iraqi and Afghan militias — and President Assad’s military and paramilitary units. In a phone call on Wednesday, President Rouhani congratulated Assad on Wednesday, saying the conquest of opposition areas after months of siege and bombing was “an important step towards Syria’s ultimate victory over terrorism”. The Islamic Republic of Iran will stand by the Syrian government and nation until terrorists are fully forced out of the country. We consider it our duty to support the flag-bearers of the fight against Takfiri terrorism, who are trying to purge their homeland of aggressors…. Today marks a great test for all countries advocating human rights. The international community’s assistance to displaced Syrians and those affected by the war is a priority for all after Aleppo’s liberation. [We are] approaching victory, and this has increased our political power. The new US President should take heed of the fact that Iran is the strongest power in the region. 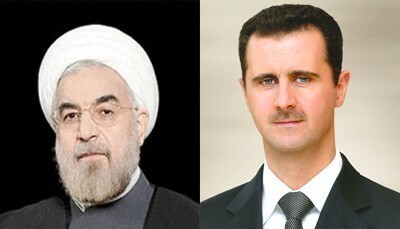 The Iranian Parliament also congratulated Damascus, in a resolution signed by 163 MPs. None of the statements mentioned Iran’s blocking on Wednesday of an agreement, brokered by Russia and Turkey, for a ceasefire and removal of rebels and civilians from eastern Aleppo city. Militias linked to Tehran and the Assad regime shelled opposition districts only hours after the truce was announced. Late Wednesday the agreement was renewed after a phone call between Turkish President Recep Tayyip Erdoğan and Russian counterpart Vladimir Putin, and further talks between the Russian military and representatives of the Assad regime and rebels. Rebels and a pro-Hezbollah activists said Iran’s conditions for the ceasefire — including the evacuation of wounded from two regime enclaves in opposition-held Idlib Province — were rejected. A pro-Revolutionary Guards site says a Revolutionary Guards Brigadier General has been killed in Syria. Hassan Akbari was slain near Palmyra, captured by the Islamic State on Monday. He reportedly was a “battalion commander” in the city.